This is a follow-up on my post Clean up after Data Protector IDB restore which was intended for Linux/UNIX Cell Managers. It will guide you through the very same procedure to clean up after a successful IDB restore on a Windows Cell Manager. The same rules and warnings apply. Please note: Data Protector program files and program data are installed to O:\OmniBack in this example. The default installation is C:\Program Files\OmniBack and C:\ProgramData\OmniBack. 07/02/2015 10:36 AM <DIR> . 07/02/2015 10:36 AM <DIR> ..
07/02/2015 10:40 AM <DIR> . 07/02/2015 10:40 AM <DIR> ..
07/02/2015 10:37 AM <DIR> . 07/02/2015 10:37 AM <DIR> ..
Move the restored database in the target directory and adjust directory junctions. Please note: The name of the directory junctions might vary on your Cell Manager. Update configuration files accordingly. For example replace all occurrences of db80_restore with db80. 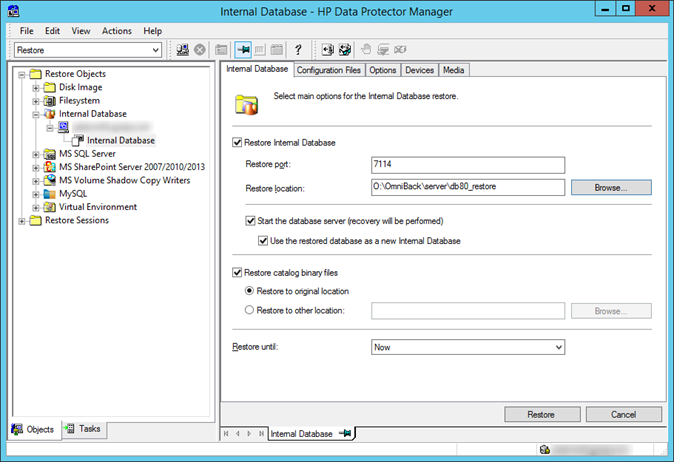 The HP Data Protector IDB services successfully started. Status: At least one of the Data Protector processes/services is not running. HP Data Protector services successfully started. OB2BAR application on "windows.syncer.de" successfully started.